The top movie in theaters this week was the film Divergent, based on the book of the same name by Veronica Roth. I can understand why this movie (and book trilogy) has made the headlines. Well-written, with deep, realistic characters, a thoughtful portrayal of loss, grief, sacrifice, and courage, and gripping action (told in the first person present tense to keep readers on the edge of their seats and inside the main characters’ heads), the Divergent series is an impressive series for anyone to have written, much less a college-aged novelist. 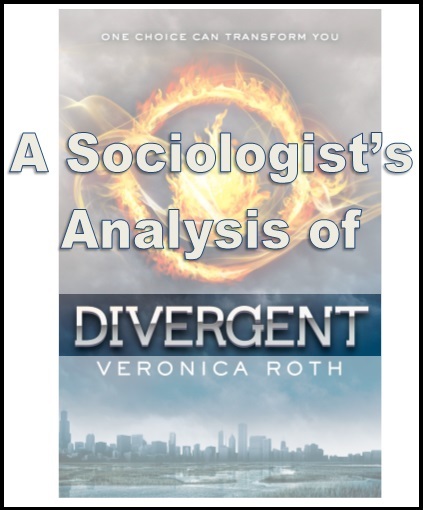 Like many fantasy, science fiction, or dystopian worlds created by people who haven’t studied sociology, the world of Divergent has a few severe flaws. To define terms, a severe flaw (in my dictionary) is one that portrays an importantly different and inconsistent reality than that which the author is purposefully trying to establish. Minor flaws are things like timeline believability problems – books where, for instance, a protagonist is supposed to go from being a clueless farm-boy to a daring knight in just a month. Those are the kinds of problems where readers can shrug their shoulders and say, “Yeah, whatever. It’s unbelievable, but not problematically so.” In contrast, severe flaws are unavoidable. They are problems so ingrained in the world that the author has built that they confront the reader throughout the book and undermine the author’s message. Unfortunately, this is a problem that the world of Divergent faces. I’ll give the “first book only” version first, for those of you who want to remain relatively spoiler-free. (The end of the second book and the third book are supposed to “fix” the problems of book one, but in my opinion, raise more questions than they answer.) In Roth’s first book, Divergent, she reveals a society that has been built around five “factions.” These factions are created to be tightly knit social groups, almost castes, in which the members of the faction all revere a single moral virtue or ideal that shapes their actions and their beliefs. Different factions have different jobs in society, different lifestyles, and different value systems. All well and good thus far. One can look at the ancient Hindu caste system and see that separating otherwise-identical people into utterly separate groups can work. But then one key component is added that makes the whole system break down. Every person is allowed to choose his or her own faction when he or she comes of age, and this choosing is aided by a test that determines where an individual would best fit. Once an individual has chosen a faction, that faction becomes his or her new family – “faction before blood” is a key line from the book – and individuals must leave their old faction’s worldview and ties behind. There are three major reasons that the faction system is severely flawed: 1) the virtue-driven nature of the factions conflicts with the nature of man, 2) the allowance of choice of factions undermines the integrity of the faction system, and 3) the creation of factions should lead to violence rather than lead away from violence. First, basing factions on non-conflicting virtues presents a problem for any individual who is given a basic moral education. As the character Four expresses, why should you be forced to choose between being strong, selfless, intelligent, honest, and kind? Why can’t you pursue all of them? Given that the characters of Divergent do seem to have a typical human moral compass, the faction system cannot work as written. ALLEGIANT SPOILER (mouse-over): Given that Four actually isn’t Divergent, and is in fact “genetically flawed” as are most other people in the world of Divergent, this makes this argument even stronger. The nature of in-groups is to emphasize what makes people in your group good and special, while downplaying, minimizing, or shrugging off the strengths of other groups. This is relatively easy to do when the strengths of other groups cannot mutually coexist with your own. (For instance, a plumber can be glad that he isn’t an electrician or a university professor, because you can’t be all of them, and it isn’t expected that you be all of them.) It is practically impossible to do if the strengths of other groups can mutually coexist with yours, and – in fact – if universal morals in your world say that other groups’ strengths are, in fact, things to be emulated. No one in the world of Divergent says that honesty or bravery or kindness or even intelligence are inherently bad. In fact, the characters display a moral code that acknowledges the goodness and the strengths of the different factions. This is a sociological problem. If an individual is ever praised for being honest when he or she is in Abnegation, or ever praised for being brave when he or she is in Erudite, it will undermine the system that is so highly revered. In short, a virtue-based faction system is not conducive to a stable society, and asking readers to believe that it has worked for hundreds of years is a severe flaw. The only way it could work, in fact, is if there is no movement between factions. This brings us to our second point. Allowing individuals to choose their own faction is to say that every individual can choose one of five equally good worldviews to follow. However, this conflicts horribly with the entire idea of being raised in a faction that truly believes that its way is right. If a child doesn’t want to obey his or her parents, then, a natural retort would be, “Well, maybe I don’t belong in this faction! Why should I follow your rules if I’m really ____ faction?” Parents in Divergent have no real grounding to answer this question – because their children would be right. If their child is actually meant to be in another faction, why should they be forced to follow the worldview and practices of their parents’ faction until they reach a certain age? Now, if factions only governed one’s job, and if the society held a common moral grounding or set of common practices, the differences between factions wouldn’t be as large an issue. (This is where one might compare Divergent to Harry Potter and the houses of Hogwarts: all children at Hogwarts know that they’re all students at the same school, that they all take the same classes, follow the same rules, and answer to the same headmaster. They all know that they take the same tests and after they graduate, they will all be members of one wizarding society. This prevents the differences in beliefs and strengths of the houses from getting out of hand – though Rowling does show rivalries and conflicts between the houses that occur, as is believable.) In Divergent, however, there is no going beyond the factions. There is no deeper moral code or religious grounding that applies to everyone. No one is above or beyond the factions; there is no emperor with divine power who everyone obeys, or even a set of common rituals and beliefs that bind people in the society together. Instead, Divergent shows five different cultures, each of which believes that its way is the right way, and yet which allows its members to freely choose a different path if they are so led. It is internally inconsistent, and should not work. Finally, and culminating from the above points, the existence of a faction system should increase, not decrease, violence in a society. Emphasizing differences between people, rather than similarities, always creates tension and keeps things from running smoothly. Every country, business, organization, and family knows that you have to emphasize what holds you together if you want to maintain peace among people who are different. Creating factions based on personality types and differing virtues is the ideal way to cause a war, not to prevent one. “Separate but equal” has always been a bad idea that leads to prejudice and violence. Integration and appreciation of differences through appreciation of deeper similarities, not segregation based on differences, is the way to keep the peace. One would think that in the aftermath of war, the leaders of a city would recognize this. On the other hand, it isn’t surprising that a college aged novelist wouldn’t. Again, Divergent is well-written, emotionally powerful, and speaks truths about psychology, morality, and the nature of man. But if Roth continues to write in new fantasy worlds, I hope she will take some time to learn more about the nature of societies as well as the nature of individuals. It will improve the quality of her work, and add to, rather than distract from, the points she wants to make in the stories she tells. I’d just like to comment that you explained the society of Divergent really well, so that’s a good sign of your sociological skills! But, you got to remember that the book is fiction. As well as the book shows the conflict when Erudite trys to take the government over and its factions. Book to acknowledges the fact of human nature and that why there is the Divergent. You also got to remember that there is people that would rather live their life and do with being in consistency and fill out of place if there is any change.